You are currently browsing articles tagged Linux. 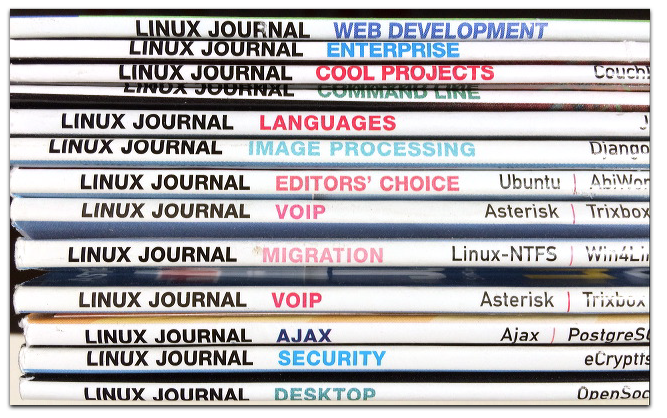 First, links to a pair of pieces I wrote — one new, one old, both for Linux Journal. The former is Linux and Plethorization, a short piece I put up today, and which contains a little usage experiment that will play out over time. The latter is The New Vernacular, dated (no fooling) April 1, 2001. Much of what it says overlaps with the chapter I wrote for O’Reilly’s Open Sources 2.0. You can find that here and here. I don’t know if that’s why those sites don’t show up in a search. [Later… now I do. See the comments below.] But I can’t think of another reason, and it annoys me that the editors in WordPress and Flickr, which I use almost every day, insert the attribute on my behalf. Putting that attribute there is not my intention. And I would like these editors to obey my intentions. Simple as that. With the help of friends in Berkman‘s geek cave I found a way to shut the offending additions off in WordPress (though I can’t remember how right now, sorry). But I don’t know if there’s a way to do the same in Flickr. Advice welcome.